Now the data from the National Youth Tobacco Survey, which represents 14.4 million high school kids, is available to the rest of us. There’s no question that high schoolers vaped more (current use of any drug in kids: at least once in the past month), and dual-use with cigarettes also increased. But exclusive smoking declined, seen below in the graph I created from my analysis. Federal pronouncements about the “epidemic” never reveal frequency of use, which is the difference between “party vapers and smokers” and more serious use. My analysis (see table below) reveals that 76.6 percent of students used neither product (bold text, upper left), an 8-point decline from the year before. Current users of e-cigarettes are in the red-bordered boxes. Almost half were party vapers (i.e. 5 or fewer days, green text). However, 28% of current high school vapers used the products 20-30 days (i.e. frequent users, red text), which is suggestive of dependence. Slightly over half of those were not currently using cigarettes (bold red text). Yes, some numbers support the government’s dire warning that some teens could become dependent on e-cigarettes. However, the FDA never acknowledges that 14% of high school kids are 18 years or older; they can legally purchase and use tobacco products in most states. Only 25% of underage vapers were frequent users in 2018, compared with 41% of legal vapers. Most frequent e-cigarette users were not virgins with respect to cigarette smoking. Among underage frequent vapers, 57% had smoked in the past. The percentages were even higher among legal-age vapers. Those percentages don’t include cigars, smokeless tobacco, and other tobacco products (as I explained years ago). These youths had already smoked, which counters the assertion that “e-cigarette use…threatens to hook an entire generation of kids into a lifetime of addiction.” Simply put, kids who use or try stuff, use or try other stuff. Finally, I have noted previously that the FDA’s campaign to eliminate teen vaping has improperly focused on tobacco retailers. The dominant sources of e-cigarettes for underage high school users in 2018 were friends, family and other individuals (71%), while the primary source for legal high school vapers were retailers (64%). Raising the legal purchase age – Tobacco 21 – remains a viable way to curb underage use. I previously showed that the FDA’s teen e-cigarette-addiction epidemic didn’t add up for 2017. 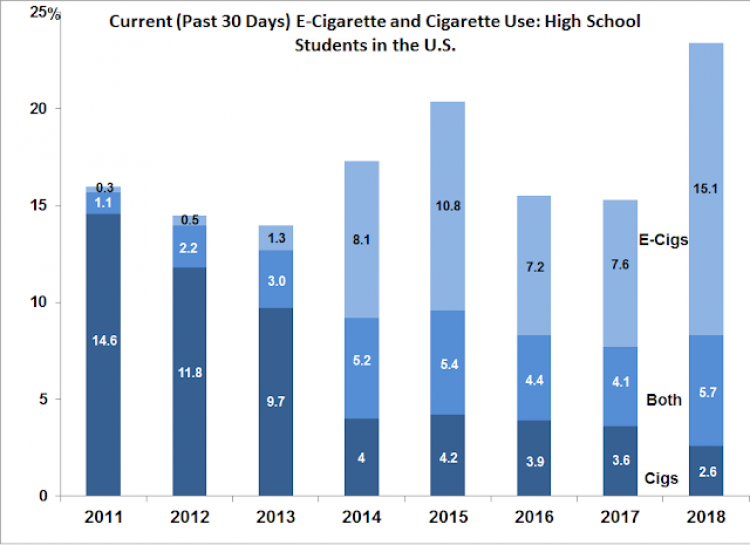 There is no question that e-cigarette use among high school students increased substantially in 2018. However, the FDA claim that e-cigarettes, especially those obtained directly from retailers, are singlehandedly hooking an “entire generation of kids into a lifetime of addiction” is exaggerated and inaccurate. This piece was adapted from an article titled “Some FDA Claims About Teen Vaping Confirmed, Others Evaporate” from Brad Rodu’s blog, Tobacco Truth. Dr. Rodu is a professor of medicine and holds an endowed chair in tobacco harm reduction research at the University of Louisville.